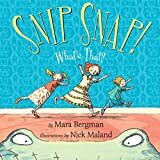 BookMoot: Snip Snap! What's That? Being allowed to read this book to kindergarteners, first graders and second graders is SO MUCH FUN, I can't believe I am getting paid to do it. From the title page to the first page of the story, we follow a path of footprints from an open man-hole cover, down the street into the lobby of an apartment building. When we look closely at the two page spread we can see a green tail disappearing up the stairs from the lobby. Three children try to keep an alligator from coming into their home but can only run and hide as he breaches the doorway. As the alligator draws closer and closer the story repeatedly asks, "Where the children scared?" and answers with a resounding, "YOU BET THEY WERE!" As the alligator's tongue is flicking and his feet are kicking, listeners enjoy becoming delightfully scared as the beast draws closer and closer. I was cracking up watching the kids hide their eyes or cling to each other as the menace approaches. illustrations perfectly convey the danger and help build the suspense. A two page close up of the alligator's head brings the peril right up to the reader's face. This was a fantastic read-aloud. I just wish I had had an alligator puppet to accompany the story.